The Best of Northfield? Downtown! Perhaps that’s a bit of a sweeping statement. 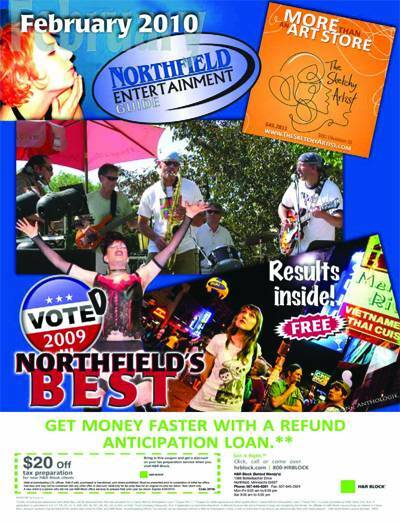 However, downtown did do quite well in the recent Northfield Entertainment Guide‘s “Northfield’s Best of 2009“. Downtown Northfield was the winner of two categories, “Best Visitor Attraction” and “Best Place for People Watching”. The NDDC’s “Be Local” promotion was also tied for second in the category of “Best Advertising Campaign”. Downtown was well represented throughout the “Best” winners. Medalists in the “Music Venue” category were The Contented Cow, The Tavern Lounge, and The Grand Event Center. Top “Bartenders” represented The Tavern Lounge, The Contented Cow, and Froggy Bottoms River Pub. “Happy Hour” was a particularly competitive category with The Contented Cow, Froggy Bottoms River Pub, The Tavern Lounge and Grundy’s Rueb’N’Stein all scoring points. The downtown winners continued. For “Non-Alcoholic Offerings”, the top three were Goodbye Blue Monday, Tiny’s Dogs All Day, and Hogan Brothers Acoustic Cafe. For the “Under 30 Crowd Attraction”, it was The Tavern Lounge, Froggy Bottoms River Pub, and The Rueb’N’Stein. For the “Teenage Attraction”, The Key was triumphant. Downtown had winners in other categories too. Just Food Co-op took the honor in “Groceries”, Buzz Salon was the winner in “Salon/Barbershop”, Witt Bros. Service, Inc. topped “Auto Shop” and “Best Value” was the Tavern Restaurant Breakfast.